What would you sacrifice to meet the man of your dreams? Zroya lives a sheltered life within the Southern Installation. Protected from the ‘contamination’ that brought humanity to the brink of extinction, she’s terrified to leave the safety of the known for the unknown. Even though women are treated like cattle within the Installation, it’s still familiar. However, it’s now Zroya’s time to become a breeder, she balks and is imprisoned. This story is sleeping beauty mixed with Dr. Jekyll and Miss Hyde. Sitting cross-legged, Draper gathered the overwhelming sea of feelings together and allowed them to wash through him as he centered himself. He could see in Zroya’s actions that she was slowly accepting him, but would it be before he was forced to leave if Zev’s scars proved to be coordinates like Draper suspected? Standing, Draper dusted the seat of his pants, stilling at the snap of a twig. He reached for his scythes, but came up empty. It was then he remembered he’d dropped them next the fire. Too vacking distracted. Gathering his energy to lash out and praying it wasn’t a human, Draper curled his hands into fists. Zroya stepped from the shadows. The tension rolled from him at the sight of her. Her porcelain skin drenched in moonlight was gorgeous. He wanted her badly, but knew she wasn’t ready for that step. Wrestling his desire under control, he continued to trace her delicate features with her eyes. “Hello? 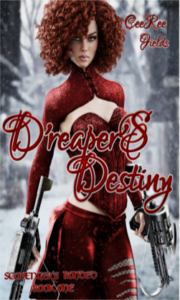 Draper?” The fear in her voice pulled Draper from his perusal. Pushing from the shadows, Draper walked towards her. “Thank the Creator! I thought maybe my father had found me.” She heaved a breath of relief. “And if he killed you? What then?” the whispered response seemed to be dragged from her. “My brothers would protect you and the people from Ketewah.” He craved to go to her and gather her in his arms. No one that met her would leave her defenseless. “You all would try.” She sniffed. “So you thought to find me?” Pleased that she’d sought him out. “I love our talks.” He didn’t add that he would talk until he was hoarse if it meant more time with her. Grinning at the image of Zroya listening to stories of him, Draper dropped his lips to her temple. Startled, her eyes met his and her fingers brushed the area. Her jade eyes met his, shadows darkened the light green depths as if they held a multitude of secrets. “I got jealous even with the stories. My mom could see this amazing future and all I had was what she chose to share and my imagination.” Her fingers plucked at the hem of her shirt. “Can you clasp your hands behind you?” she whispered. “I asked her to take me with her and she did. She couldn’t bring me often because it drained her. She’d be almost comatose for days after, which I now realize left her very vulnerable.” Her voice trembled and he kissed the crown of her head. “Which dreams did we share?” he asked, hoping to pull her from the past.